Some things in life are just plain hard. One of these is my girls getting older. I love every stage and age, but moving on to the next one seems to be getting more and more difficult. 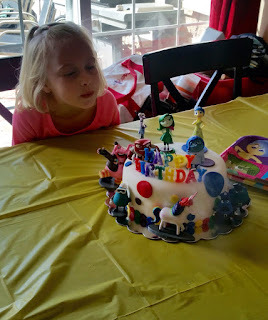 Ellie turned seven last week and it hit me harder than any of my girls' birthdays ever have. There is something about that age that seems to be the transition from little kid to big kid. Even though she'll always be my baby, she isn't a baby anymore. I'm just glad she is such a lovey, snugly little thing or I'd really be in trouble. It also helps that she's still a little string bean and light enough to easily pick up. But I'm not sure how much longer she'll want to be picked up and held. Change has always been hard for me, but I've tried to learn how to accept and sometimes even embrace it as I've gotten older. However this is one kind of change I just am not ready to accept. I am however trying to prepare myself to be ready to accept whatever my doctor tells me tomorrow. I am hoping to get the green light to start easing back into running, but I'm a little nervous. My ankle doesn't ever hurt when I am exercising or when I run down the stairs (which was still painful a few weeks ago when I'd forget and head down them too quickly), but it does still ache occasionally. I know this is normal for the site of a stress fracture, but it still makes me nervous. As badly as I want to run again, I don't want to come back too soon and end up having to take even more time off. Another week or two versus another month or more because it hasn't healed and I re-injure it? Kind of a no-brainier.